. Hiroshima Folk Toys . The speciality of this doll is the headband of three dots in a cluster. The eyebrows are like tsuru herons. 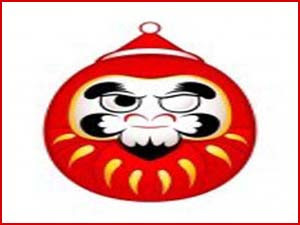 Daruma is the new symbol of Mihara Town, Hiroshima prefecture, which hosts a Daruma Museum at the Temple GokuRakuJi. 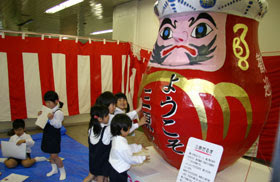 Children unveil a large statue of Daruma san. The statue is 2,15 meters high and 4,3 meters around the belly. It took 10 people to make this one ! My aim was the temple Gokuraku-ji, 極楽寺、the Paradise Temple, which now houses the famous Daruma collection of Mr. Aoyama, the former chairman of the Japanese Daruma Research Association. Climbing up the many steps toward the temple, first a three-storied pagoda comes in sight. Please open the corresponding photo album for this story in a different window and see Pictures 01 and 02. 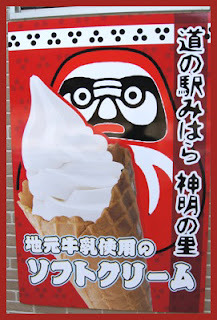 Then the Daruma Museum comes in sight. Pictures 03 and 04. The head priest, Mr. Ishii, showed us around in the precincts and the museum. He is a very kind and knowledgable man and we shared our love for Daruma san. Mihara papermachee Daruma dolls are now made by Mr. Kubo and he has some helpers with him. 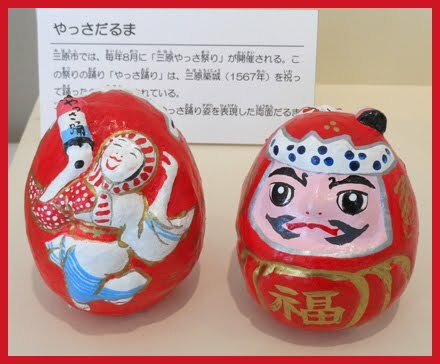 The typical Miharu Daruma are about the size to hold in one hand. They wear a headband with blue dots and have a weight at the bottom. Inside are some stones or a little bell, so they tinkle while trying to stand up. The eyebrows are in the form of a crane and the beard like a turtoise. 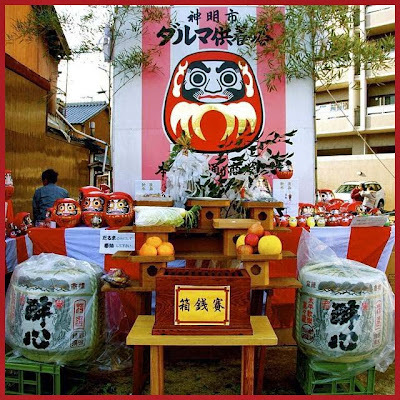 In former times, all families in Mihara had a set of Daruma dolls in the Family shrine, with just the number of members of the family to protect them all during one year. Every year at the Festival of the Shinmei shrine, they would buy new ones. There is also a funny version of a papermachee doll of an octopus, a speciality of this fishing town. For dinner, of course you can now guess our food. Kubo san also makes dolls with the animals of the Asiatic zodiac for every year of the 12 year cycle. 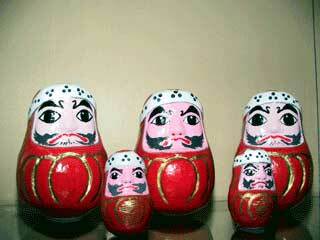 Look at the Daruma on a horse, a sheep and with a snake. Pictures 12, 13 and 14. 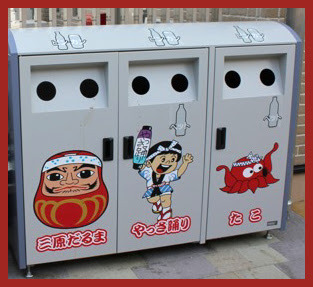 There is even a female Daruma with GOOD LUCK on her belly. Three weeks before we visited, the Japanese Daruma Study Association had a meeting at Mihara, where Kubo san had made a special Daruma of Three Generations, Sandai Banzai Daruma. Ishii san had some left and gave me one as a present for my own museum. This one has a little bell and tinkles. Now let us take a look at the Memorial Museum with the Collection of Aoyama san. He had about 6000 pieces, which added up with the 1000 of the collection of Ishii san himself. Now they are stored in a two-story concrete building, sandwiched into the small temple compounds on the slope of East Village, Higashi-machi. Take a look at the shelves filled with papermachee, wooden and other Daruma dolls. Pictures 17, 18 and. 19. The new Memorial Museum is now a new tourist spot of Mihara, featured in all newspapers and publications and Ishii san is busy taking care of the many visitors. For the opening of the new museum, there is also a ricewine, usually drunk during the Shinmei festival and some fans were produced. Ishii san kindly provided me with some samples. Pictures 21, 22 and 23. You could also purchase a votiv tablet for making a wish. Of course, Daruma would grant it. 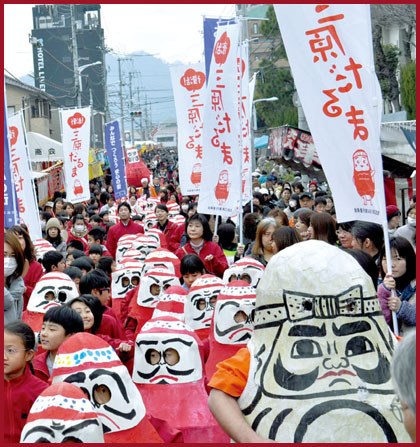 This is the great Daruma Market in Western Japan, in Hiroshima prefecture. The second Sunday (and Saturday) are the great days of the Shinmei Festival (神明市) at the famous Zen temple Buttsuu-ji (佛通寺) within the parc precincts of the Yahata Shrine. From Mihara Station it takes about 40 minutes to reach the temple by bus. One of the big Daruma figures is about 3.5 meters high, made from a bamboo scaffold and covered with old newspaper before coloring it all red. Mihara boasts the biggest papermachee Daruma statue of all Japan (Nippon Ichi　日本一). See Pictures 25 to 28. This Zen Temple is famous for the red leaves in Autumn and we were just in time to catch some of them. This temple was founded in 1397 by Kobayagawa Haruhira, who had the priest Guuchuu open a temple of the Rinzai Zen sect. Now it is one of the biggest Zen Mountain Temples in Japan. It features retreats every month and also welcomes foreigners, as the priest told me. It must be pretty cold and humid to stay here during the winter months. During our stay, we could see some damage from the many typhoons this year too. Still, the remoteness and natural setting of this temple, rather a Valley Temple than a mountain one, strikes the seeker in so many ways. At the entrance is a huge cliff on the other side of the river, with the Chinese characters for Buddha and Veneration engraved high up there. Now with the red leaves it is quite spectacular. A seated Jizoo Bosatsu keeps watch over the way toward the temple. A row of impressive stone lanterns sheltered by red leaves. Picture 32, 33. 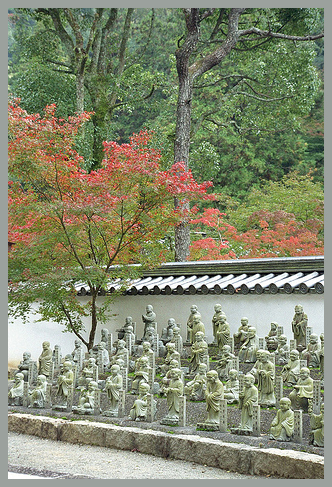 Inside the temple in the garden corne are the shelves with figures of 500 Arhats, Gohyaku Rakan, pupils of the Buddha, are most striking in the autumn setting. Next we see a huge pine tree, almost in round shape, with splendid forest and a smaller pagoda in the background. Pictures 38, 39. More pictures of the temple garden, with stonegravel and foilage all around. Pictures 40 to 42. An especially bright red tree in the garden. Picture 43 to 45. At the entrance to the main hall is a huge painting of Daruma, painted by the 5th head priest of Buttsuu-Ji. Picture 46. And from inside, through the latticed window, you have a mysterious view of the garden. parts the cliffs and falls down, before gourging through the valley of the temple. And my own pictures of the cliffs and boulders by the roadside, 48 and 49. We did not venture further down to see the waterfall completely, since these moutains are full of hungry bears these days and you need more equipment to walk safely in the woods. The Waterfall again, with a fall of 50 meters it is the fourth longest in Hiroshima Prefecture.
. Hiroshima Carps 広島カープ Baseball Daruma .